Of all the games in the classic Mega Man series, the fifth entry is the easiest. Some may cry foul about Mega Man 5’s relatively easy challenge, given that Mega Man and extreme difficulty tend to go hand in hand. But Mega Man 5 didn’t signal a dumbing down of the series. Later entries would go back to their brutally difficult ways. Mega Man 5’s more accessible and welcoming approach simply makes it a unique title in the series. 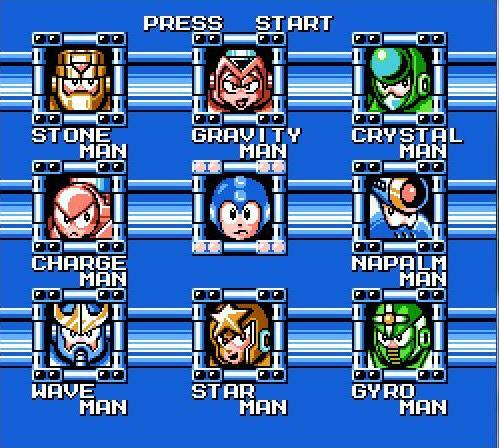 It shouldn’t come as a shock that Mega Man 5 uses the same basic setup as its predecessors: The game starts with eight selectable stages, each one headlined with a different Robot Master. Mega Man gains new powers upon defeating each boss, with certain Robot Master abilities working particularly well against others. Once all eight stages are cleared, Mega Man moves onto the linear stages in the castle levels. So Mega Man 5 isn’t exactly a reinvention of the series. But it does have some creative ideas of its own in regards to stage design, some of which have notable effects on the gameplay itself. The two most prominent examples are Star Man and Gravity Man’s stages, whose concepts may have served as inspirations to Super Mario Galaxy. Star Man’s level throws Mega Man into an outer space setting, which means the Blue Bomber can defy gravity and jump higher than ever, making for some unique platforming. 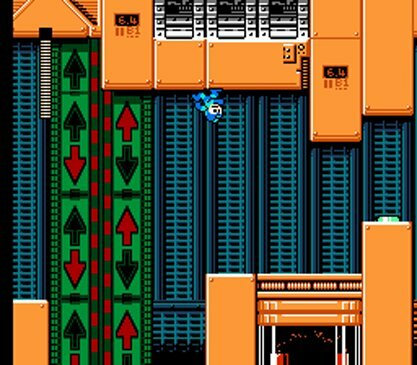 Gravity Man’s stage will continuously send Mega Man walking upside down on the ceiling and back again, and falling upward becomes a whole new hazard. 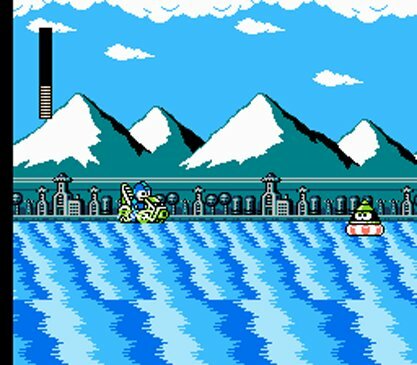 The other levels also introduce their own fresh ideas to the series (the jetski section of Wave Man’s stage is another highlight), which helps keep things fresh and exciting. One downside to Mega Man 5 is that the Mega Buster – Mega Man’s standard weapon – still feels a bit overpowered, as you’ll probably rely more on charging Mega Man’s arm canon than using the Robot Master powers (save for in the boss battles). This is a bit of a shame, as some of the Robot Master abilities here are pretty cool, such as Gravity Man’s Gravity Hold, which lifts enemies off the screen. There are still some powers that are recycled from Mega Man 2 (“Wood Man’s Leaf Shield can’t be reskinned enough!” could have been the series’ tagline by this point), but overall they’re more fun than those found in Mega Man 4, even if they rarely need to come into play. Mega Man’s dog Rush still keeps his jump-boosting coil and jet abilities, but his submarine transformation has been left behind. Mega Man also gains the Super Arrow, which not only hurts enemies, but can also be ridden as a moving platform. Additionally, a secret power can be unlocked that summons the robot bird Beat to attack enemies and destroy hazards. In terms of story, Mega Man 5 more or less recycles 4’s plot, but gives extra attention to fan-favorite Proto Man. Proto Man has gone bad it seems, and he’s sent eight Robot Masters of his own to wreak havoc on the world. It wouldn’t take Sherlock Holmes to deduce that Proto Man is being framed, and of course there’s only one culprit who can be behind it all. It’s another incredibly simplistic story, but it once again extends the adventure to a second castle. It’s in the castle stages where the game’s difficulty picks up a bit, but it never becomes as punishing as Mega Mans 3 or 4. The game also retains the lively sprites and vibrant graphics of the series’ other NES entries, and the character designs are an overall step up from Mega Man 4 – even if there’s no single Robot Master as remarkably awesome as Skull Man. The music is still catchy, though unfortunately it isn’t nearly as memorable as those of Mega Man’s more popular titles. In the end, Mega Man 5 may not match the heights of the series’ heralded second and third entries, but it adds enough fun and creative twists to the gameplay and level design to make it consistently fun and engaging (because seriously, Gravity Man’s stage!). Its easier difficulty also makes it a welcoming starting point for newcomers to the iconic series, and a nice reprieve for veterans of the Blue Bomber. I think Mega Man 5 has one of the weaker arsenals in the series. I remember the Power Stone and the Charge Kick being particularly annoying to hit enemies with and the other weapons seemed a little too situational (besides Beat, who breaks the game hilariously). That said, I still found it more enjoyable than Mega Man 4 despite not making any substantial changes to the series’ formula. It seemed like the levels were a bit more creative this time around. As you said, Gravity Man’s stage is the best example. I don’t mind the Charge Kick so much, but I agree that the Power Stone is absolutely annoying. It’s like Wood Man’s Leaf Shield (of course), but the rocks fly so far away from you they don’t protect you, and it’s hard to hit enemies with it. The level design is just a huge step up from 4 in terms of creativity. So, even if Mega Man 5 has its missteps, it ends up being a better game than 4 (and probably 6 as well, but I haven’t revisited that one quite yet). I remember getting frustrated with the Power Stone when fighting Charge Man; if you stand too close or too far away, you’re going to miss every time. There’s also the Star Crash. If you count the Power Stone as a barrier weapon, that means Mega Man 5 has two of them. They sort of went crazy with them after the Leaf Shield, didn’t they? Personally, I’d say my favorite one was the Jewel Satellite from Mega Man 9 because it reflects enemy bullets. I have a definite stance on 6, but I’ll save it for when the time comes. I am looking forward to your takes on Mega Man 9 and Mega Man 10. I wonder if you love them as much as I do. I would be aboard with any strategy really. I have’t played many of the middle Mega Man games, so it would be interesting to see how you evaluate them. At the same time, I have played 9 and 10, so I want to see how your opinion compares to mine.